The last two weeks have kept me busy with puppet fabrication projects. All three character sculpts are finished, the molds are made, and I've cast foam versions of the puppets with wire armatures. These foam tests will be passed to the costumers(!) to begin the costume fabrication. I'm so grateful to have a talented team of passionate folks working together on this project. The film really couldn't be made without their help. So, here is the work from the last few weeks. Ok! Process! I made a short video that briefly explains the process of mold making and casting expandable foam. 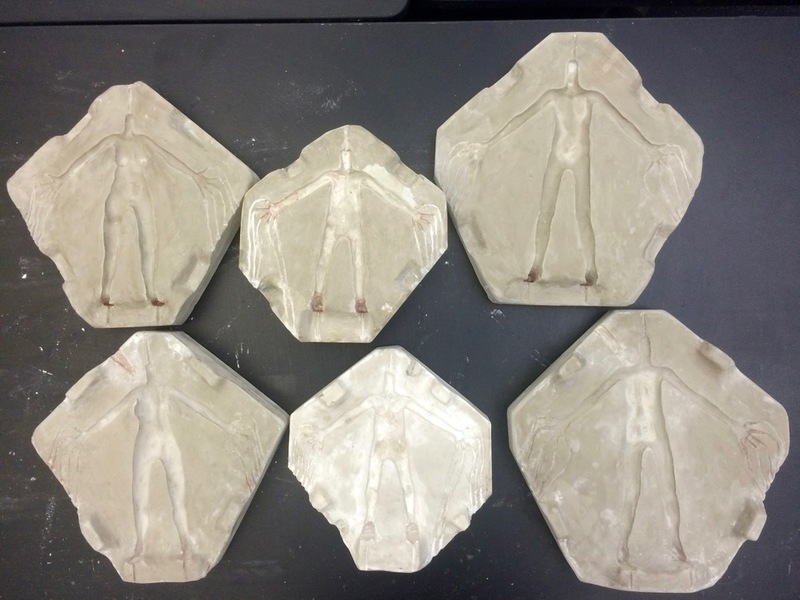 My friend and classmate, Caitlin Low has written a much more detailed description of the process as well as tons of information about stop motion can be found here: How to Cast Expandable Foam in A Plaster Mold. There is a wealth of information on her blog and I would encourage anyone interested in this process to dig into her blog. The detailed process of making the plaster molds can be found here: How to Make a Plaster Mold. Detail of dress shoes that will be painted in silicone with the puppet. The head sculpts are all finished, the process of facial replacement animation can take many forms. I'll be casting the heads in plastic and creating replacement faces that attach with magnets. The eyes will be cast in epoxy, with painted pupils. The hair will be created using a wig making technique and hair punching into a silicone cap. The heads and faces will be the next big bulk of the fabrication work. I'm aiming for a slightly strange realism. Therefore the features of the face are not broadly exaggerated or caricatured. An early version of the heads, the hair is just a sketch of an idea. The final hair will be made separately and not cast in plastic. Final face sculpts. Dad's mustache is coming back, in real hair! The prop designs also follow the same realist aesthetic. I'm hoping to set these up for the silicone molds this weekend. I'll be casting them all in plastic and painting them. The flashlights are going to be rigged up with LED's and will be functional lighting for in-camera lens flare! The desktop computer monitor will also be lit. Can't wait to get started on those projects. Macintosh Classic ii, a beautiful classic from 1991. Motorola DynaTAC 8000X. A phone to be missed. Flashlights, soon to be realized and lit! Enamel camp kettle and camp mugs. Mom's Birkenstocks. The straps will be cut from suede and the soles made from mini corkboard and rubber. Next Steps: Casting and painting the heads, faces and props. Hair. Costumes. Set building!